Discussion in 'Promethean Knives by Salem Straub' started by Salem Straub, Jan 28, 2016. This is an improvisational short sword, pulling together disparate elements from various metal arts and points in history. The blade is double edged, and hollow ground on a 4 wheel. It features a single fuller on each side, ground on a 2 wheel. 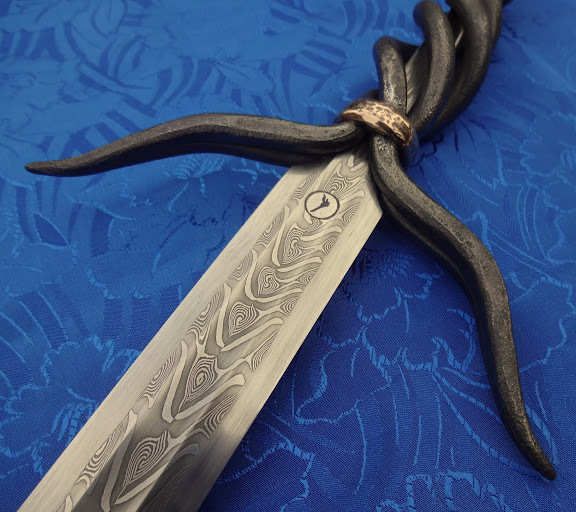 The blade is pattern welded in four bars, the cutting edges being solid CruForgeV, and the twisted center bars being 15n20 and CruForgeV in a merovingian twist pattern. The tip is forge welded in the bird's beak manner. The quillons, grip, and pommel are all one piece, being forge welded, tig welded, and twisted together. The material is AISI 1018 mild steel. It features decorative collars of silicon bronze, forged and brazed around the steel. The sword may be fully disassembled, by removing the turned silicon bronze finial nut, using the stainless and nickel silver takedown tool provided. Assembled nut and pommel form a fleur-de-lis motif, together. The blade has been tempered springy, and is currently unsharpened. I will ship sharpened, at customer's request. No scabbard is provided- if one is desired, I would prefer in this case to send it to a leatherworker. I can recommend a couple if needed. My asking price is $1550 US, insured shipping included to the United States. Inquire for international rates. Here's some pics and a vid. Enjoy! I make knives to the best of my ability, in terms of performance, aesthetics, and value. If you feel my knife that you've bought to be lacking in workmanship or serviceability, please return it for your money back in full. Or, visit my website for a look at my Lifetime Warranty and for my contact info. I am not taking orders at this moment, except for under select circumstances and for some kitchen knives. Feel free to contact me to talk about it if you wish.